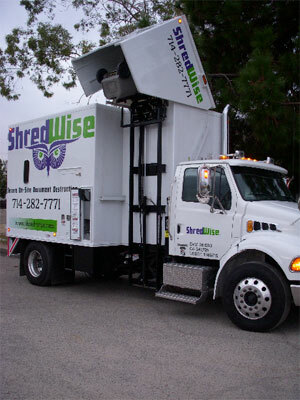 On-Site/Mobile Document Shredding is the most convenient, safe and secure solution in document destruction. You can witness the shredding of your confidential documents first-hand and even watch the process on the onboard shred-cam located on all of our trucks. We will arrive at your location, shred your documents, and provide you with a Certificate of destruction once the shredding process is complete. This certificate provides your business and your customers with added assurance, and shows your compliance with state and federal laws and regulations. We take great pride in our document shredding services. Our automated shredding trucks, which are the fastest and most modern in the industry can shred as much paper in one hour as your office could in months. With efficiencies such as this, our document shredding service is capable of handling your task, large or small. Reap the benefits of secure document shredding without the considerable risks involved in transporting your documents off-site. Having a regularly scheduled document shredding service gives you the peace of mind not to worry about what to shred or when to shred it. We will follow our agreed upon shredding schedule which is tailored to your needs and your chosen frequency through weekly, bi-weekly, monthly, or bi-monthly services. Your sensitive documents are never transported off-site, which adds additional security to the process. All your materials will be shredded before leaving your premises. You may witness the destruction of your documents first-hand if you so wish on the camera we call the “shred-cam” on the side of each of our trucks. Eco friendly. 100% of the shredded paper is recycled. With Ongoing Scheduled Shredding service, we will place secure lockable containers throughout your office in high-traffic areas. This will make it extremely easy for employees to dispose of sensitive documents that need to be destroyed rather than having them pile up in recycling totes, being thrown into the trash or exposed to cleaning crews. You can choose from two types of lockable containers; Secure Consoles or Security Bins. The Secure Console is approximately 35″ tall and 19″ x 19″ square. It looks like a piece of office furniture and has a slot in the front to accept your paper into the locked inner compartment. Inside the console is a big bag which collects your sensitive and confidential paper. Because the Secure Console looks like a piece of office furniture it fits well into an area with customer traffic. It also fits well into small spaces as it can be nestled between two pieces of furniture, as an extension of a desk or tucked away in a corner. It will hold approximately 100 pounds of paper which is about 3 standard file boxes of paper. The Security Bin is a 64 gallon rolling bin made of plastic that locks and has a slit in the top of the bin to accept your papers. The Security Bin is versatile because the top can be thrown open wide allowing you to pour a full box of office paper into the top. This container would be best suited for areas like copy rooms where you do not have customer traffic. It measures approximately 40″ high, 23″ wide and 29″ deep (including the handle) and holds approximately 200 pounds of paper which is about 6-7 standard file boxes (12″ x 15″ x 10″) of paper. Found Shred Wise through the Orange Chamber of Commerce about 3 years ago and couldn't be happier. Gary comes to your office monthly, swaps out the bin and shreds on site. Couldn't be easier. For easy, convenient and professional service I highly recommend this company.